Front wheel drive will be incorporated into the 1.8 liter TFSI and 2.0 liter diesel and the AWD Quattro drivetrain will be incorporated into the 2.0 liter TFSI. 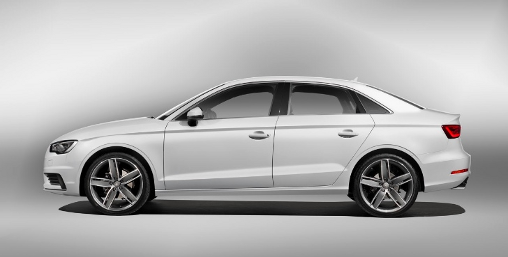 The 2.0 liter TFSI model is also available in a S3 trim. This configuration will feature 300 horsepower, stiffer suspension and most likely all wheel drive. 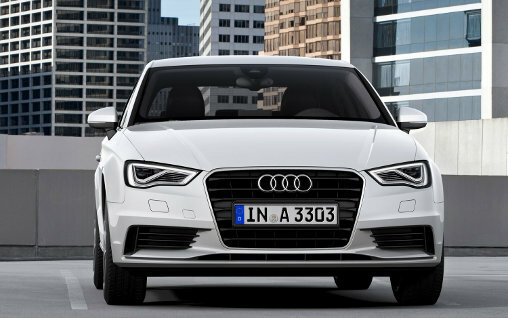 In terms of exterior design, the 2015 Audi A3 sedan endows the familar Audi signature grille as well as more angular lines most noticeable in the grille, bumper vents, headlights and mirrors. Overall, the exterior cut through wind with a drag coefficient of 0.29, not bad for angular lines. 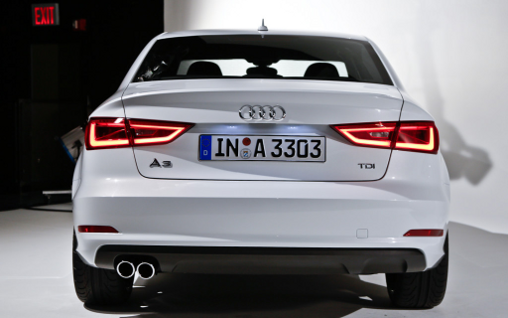 The A3 has been totally redesigned for 2015 with a new platform, nothing has been carried over from the current A3 model. Audi engineers have reduced the weight to a weight 2755 lb which attributed to an improved handling and less fuel consumption. Under the hood the 2015 Audi A3’s 1.8 liter TFSI outputs 180 hp and accelerates the 0-100km in a brisk 7.3 seconds. The 1.8 TFSI engine’s fuel economy comes in at 5.6 L/100 km in early test results. The 2.0 liter TDI (diesel) produces less horsepower at 150hp and goes from 0-100km in 8.4 seconds but overall gives you a much better fuel mileage at 4.1 L/100km. The S-tronic tranmission provides smooth shifting in both automatic mode as well with the steering-wheel mounted paddle shifters. The transmission also comes with an option called “magnetic ride system” which offers up three modes of driving experience Auto, Comfort or Sport. As with the majority of new cars out there, the steering is handled by an electric assist motor, which makes the 2015 A3 steering feel a bit light. The new 2015 Audi A3 sedan does include quite a few high-tech items like the available LED headlights, blind spot warning, active lane assist, adaptive cruise control and emergency braking system. The latter is called “City Emergency Braking” and works by using radar sensors to automatically brake the car to avoid collision when the car is driving under 30 km/h. The interior of the 2015 A3 is up to par with what Audi is known for, some of the most refined car cabins around. The interior is polished and luxurious. The seating in front is quite comfortable, but because this is a compact sedan the rear is a bit cramped. The cargo size / capacity of the trunk is 425 liters, but good thing you can fold down the rear seat for more storage (hatchback A3 is no longer available). 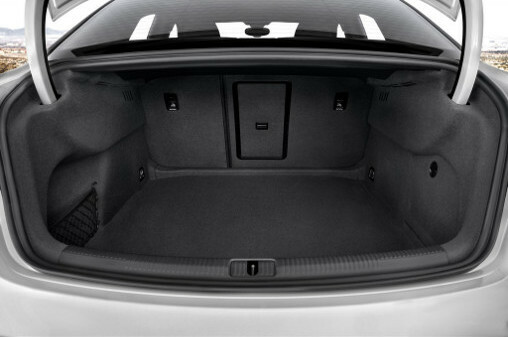 With the rear seats folded down the A3 almost doubles its storage size to 880 liters. Because the hatchback has been cancelled, you still won’t be able to go to IKEA and put in a piece of furniture. Leather seats up front are comfortable and offers good support, then interior has a 7 inch touch screens with navigation that works flawlessly. Most of the car controls are operated by a controller on the center console. For people who enjoy high quality sound there is an available 705 watt, 15 speaker Bang and Olufsen sound system. 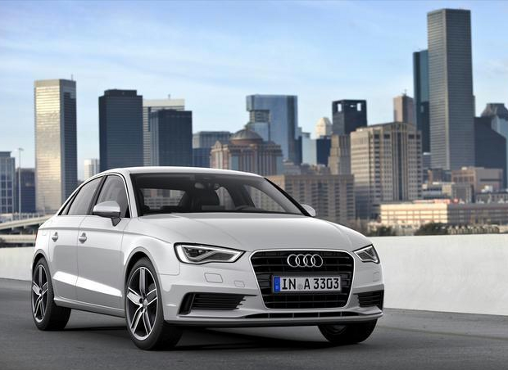 The 2015 Audi A3 luxury sedan is slated to arrive in the spring of 2015 for the North American market. This luxury sedan should appeal to more buyers as apparently the hatchback model was not as popular as Audi thought it would be.